Hibernate is a powerful library for mapping relational data to Java classes. Setting up the Hibernate object-relational mapping and writing basic Hibernate queries to create, read, update and delete table data can be tedious and time consuming. This paper introduces WaveMaker as a way to automate the generation of Hibernate classes, including support for managing related tables, creating custom HQL queries and defining custom Hibernate views. The WaveMaker studio is a free and open source software tool for building web applications. WaveMaker imports a database schema and automatically generates corresponding Hibernate classes. With WaveMaker, the developer can also modify the schema, define views and create queries from a visual editor. 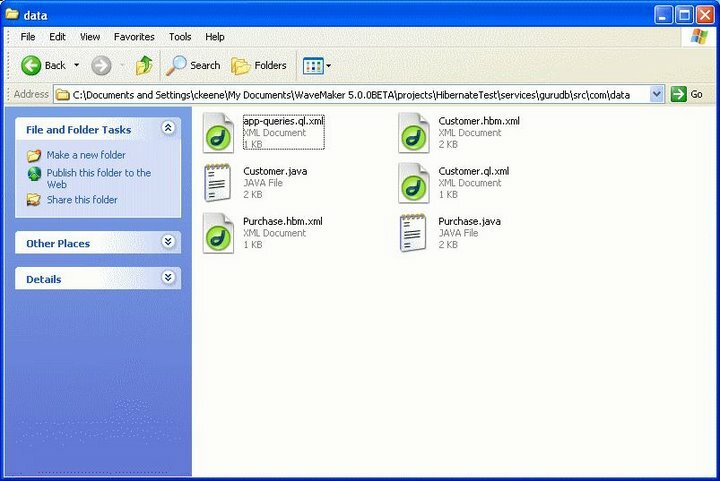 Once the mapping, views and queries are defined, WaveMaker generates Eclipse-ready project files or WAR files that can be deployed onto any Java server. 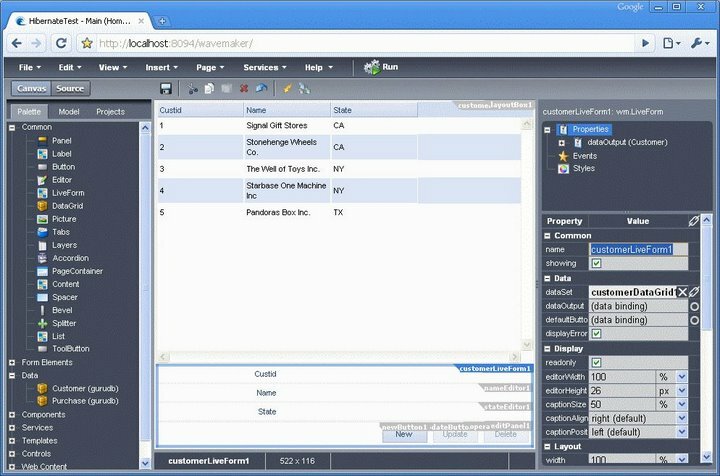 Wavemaker also provides visual tools to connect Hibernate classes to an Ajax front end. Hibernate And Web Development The Hard Way - Hand Coding The Hibernate "Stack"
With Hibernate, a developer can link complex relational schemas to equally complex Java objects, complete with relationships, queries and transactions. Yet all this power comes at a cost. Hibernate has a steep learning curve that requires understanding a whole new query language (Hibernate Query Language, or HQL), a special format for specifying data mappings (hbm.xml files) and another format for connecting to databases ( cfg.xml files). In addition, working with Hibernate requires a good deal of Java programming to create Java classes that implement methods to get and set attribute and relationship value. Each HQL query also requires its own Java class. For Java developers who are building web applications, getting the server-side Hibernate infrastructure working is only the start. The developer still needs to use a service such as JSON RPC to serialize Java data into a JSON format and pass it over to the client. Similarly, the client framework needs a way to invoke Hibernate methods on the server and pass the necessary JSON structures back and forth. Step 1. Import existing schema or create schema: the WaveMaker data model editor can import or create schemas for all major databases, including MySQL, PostgreSQL, Oracle, DB/2 and MS SQL Server. 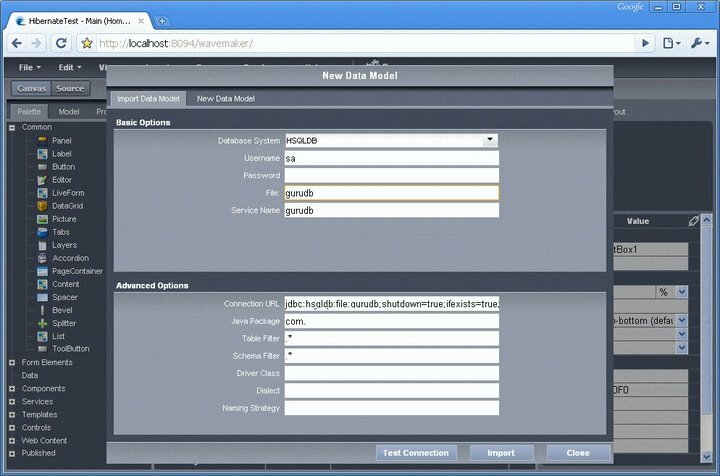 HSQLDB is bundled with WaveMaker as a built-in database. All Hibernate Java classes and xml mapping files are created automatically at this point. Step 2. Create custom queries: the WaveMaker HQL query editor allows you to create and debug Hibernate HQL queries on the fly. The developer specifies the query and any input parameters, then can test the query by providing the required parameters and getting the results. Step 3. 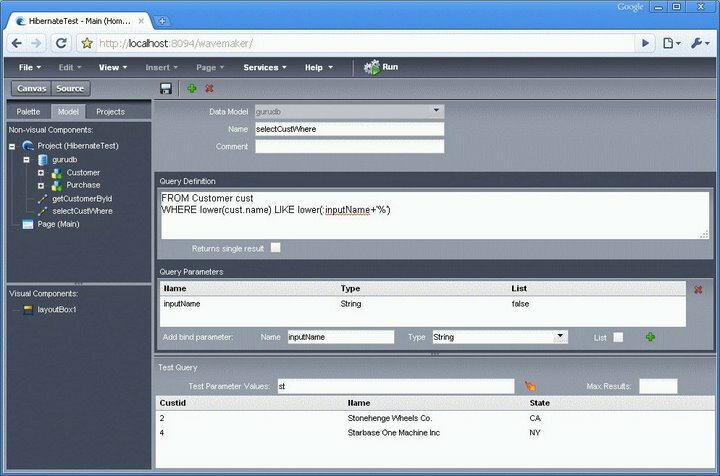 Add custom Java: add Java libraries or Java classes to WaveMaker using Eclipse or any other standard Java IDE. Step 4. Create Web GUI using drag and drop tool: use WaveMaker's browser-based studio to drag and drop Ajax widgets onto a canvas and connect them to Hibernate methods via a visual binding editor. 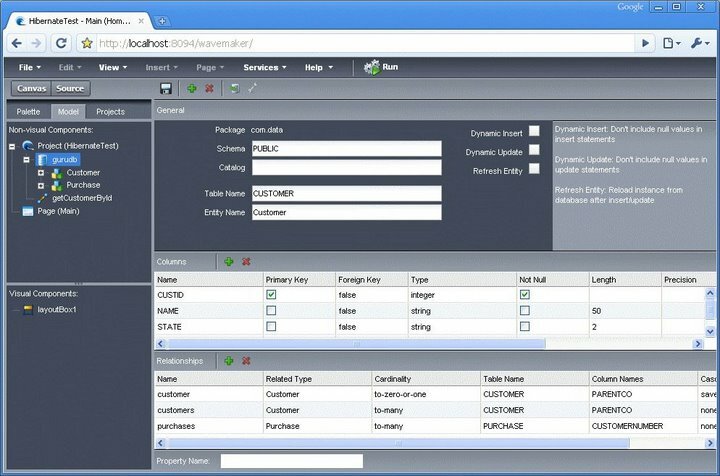 You can run these applications dynamically using WaveMaker's built-in Tomcat server. Step 5. Deploy application to any Java server: with WaveMaker's live deployment capability, create a WAR file and deploy it to any Java server, including Tomcat, JBoss, Glassfish, WebSphere and WebLogic. The following table compares the steps required to build a web application using Java and Hibernate by hand versus automating the same task using WaveMaker. WaveMaker can be downloaded at www.wavemaker.com or access the cloud version at www.wavemaker.com/cloud. This shows using WaveMaker to import a database and create all required Hibernate Files. The following screenshot shows the database import screen for WaveMaker. Note that you can select your database from a drop-down list (this example uses WaveMaker's built in HSQLDB database). You can also create a new database using the data model editor. After entering the database login information and pressing the Import button, WaveMaker imports the database, creates all necessary Hibernate files, and displays the schema in the data model editor. Column and relationship information for each table are displayed in grids. Once the database is imported, you can go to the Hibernate file directory to see all the files created automatically by WaveMaker. If you are a do it yourself kind of person, you can simply pick up these files and drop them into whatever Java project you like. WaveMaker also includes a Hibernate query editor and HQL debugging tool. This shows an HQL query with an associated parameter. At the bottom of the screen you can see the results from running the query. Once you have defined your data model, you are ready to build an application. WaveMaker automatically creates a business data widget for each table in your database. Simply drag the data widget onto the canvas to automatically create a CRUD application. This shows the business data widget for the Customer table dragged onto the canvas. Note that you can see live data even within the design studio. Press the run button to perform a test run of your new web application using the built-in Tomcat database. Here is the generated Customer.java file created by WaveMaker. Here is the generated Customer.hbm.xml file created by WaveMaker. Chris Keene is the CEO of WaveMaker (www.wavemaker.com). WaveMaker makes Java web development easier and faster. Chris was previously the CEO of Persistence software, the company that pioneered object-relational mapping and caching. His blog is www.keeneview.com.